I took the day off yesterday to check out some local nurseries for dahlias and eucomis in flower. (All my eucomis were bought as bulbs, some with leaves purportedly of varieties as dark or darker than ‘Oakhurst,’ but all instead carry leaves of the brightest green.) One of the nurseries was minutes away from the Sherman Library & Gardens, so I popped in for my first visit ever to this gem of a garden tucked into the busy shops and restaurants of Corona del Mar, just off Pacific Coast Highway within sight of the Pacific Ocean. A courtyard garden had been famously redesigned by Matthew V. Maggio in 2005-2006 during his internship there as a horticultural student. Prior to the renovation, the courtyard garden had been known as the Cactus Garden and included the requisite cactus kitsch, sun-bleached steer skulls and splintered wagon wheels, which Matthew felt more rightly belonged on a Hollywood movie set than a garden. 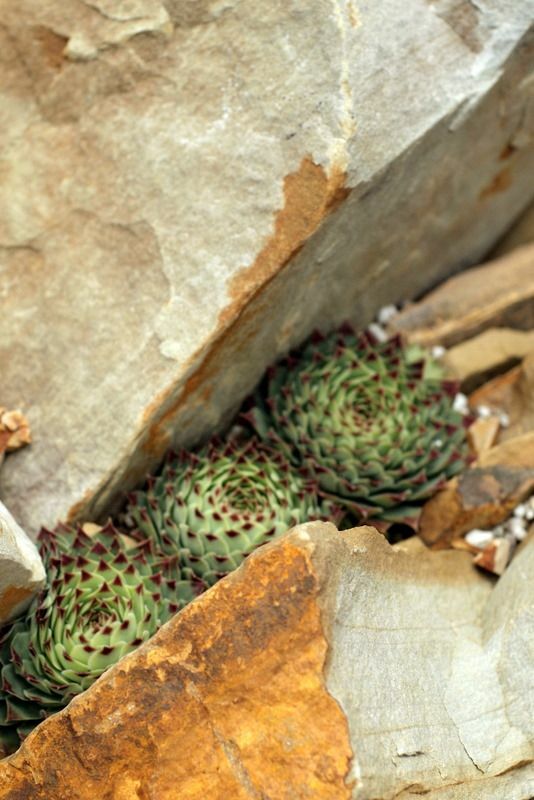 Macabre ornaments such as these, depicting death and decay, mischaracterize and obscure the true story of ingenious survival written in every succulent. 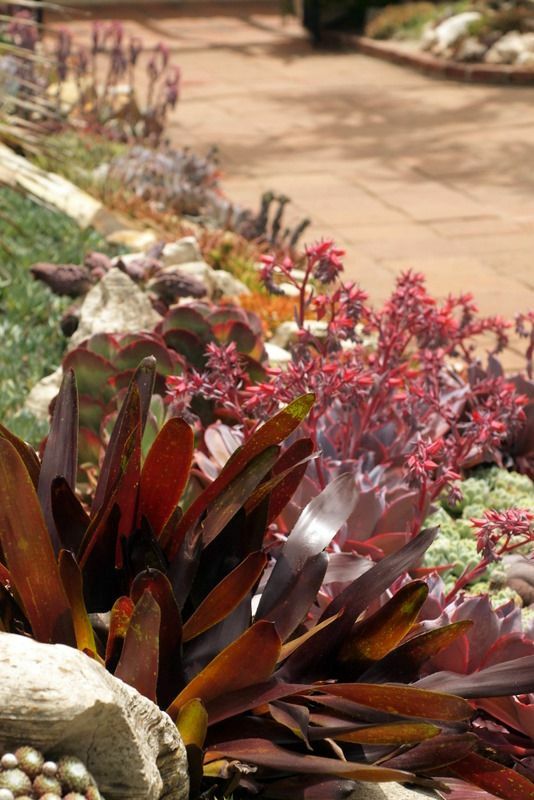 In an article Matthew wrote on the making of this garden for Pacific Horticulture (Volume 71, No. 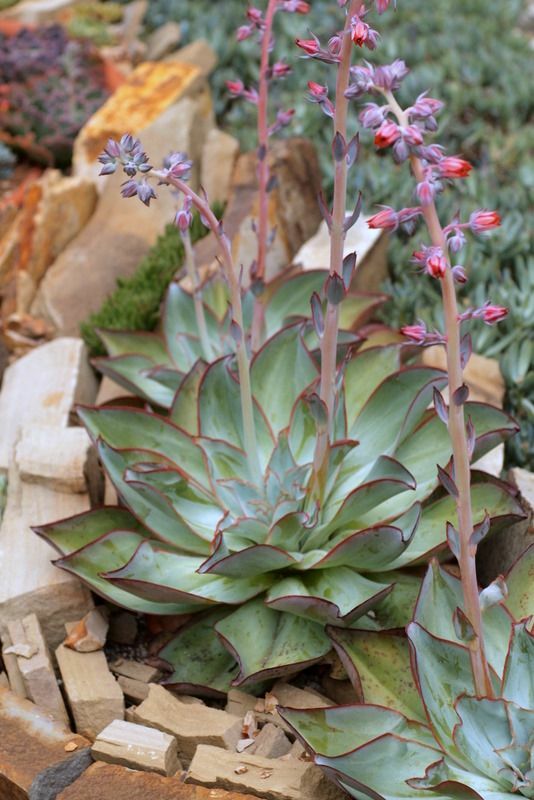 4, Oct/Nov/Dec 2010), he shares his goals to “shatter conventional views about succulent plants, engender lasting excitement over succulents, inspire design creativity,” and in the new garden each of those goals is met and surpassed. All quotes are from this article. 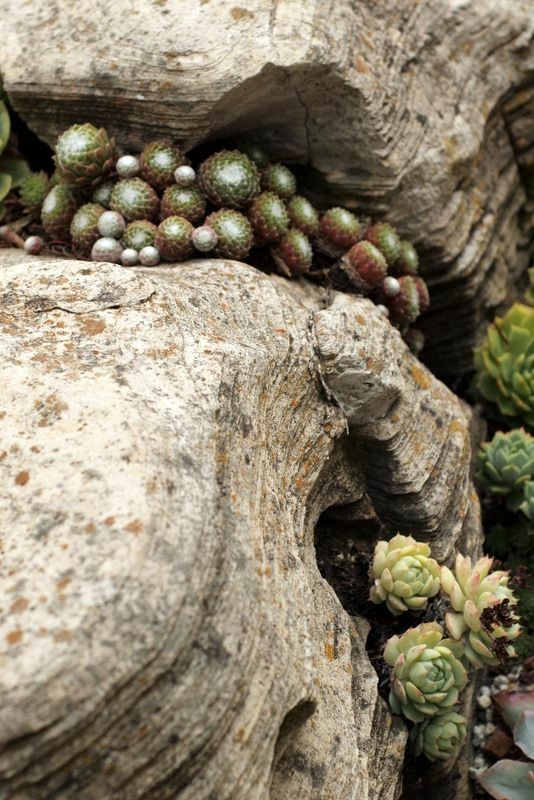 To prepare for the restoration, plants from the original garden were dug up and sorted. Ultimately, some never made it back into the new garden. Eliminated were “numerous miniature cacti, some euphorbias and subtropical caudiciforms, not because of their requirement for spring/summer moisture, but because of their intolerance of damp mediterranean winters.” Many plants had simply grown too large for the space allotted, casting too much shade and/or obliterating sight lines, such as four enormous, overgrown tree aloes and a grouping of 30-feet tall Euphorbia ingens. But many mature specimen plants were preserved and reinstalled in the new garden. At the garden, there was an interactive feature available tied somehow to one’s cell phone, which I didn’t attempt to use. Perhaps plant identification was provided. Otherwise, plants were not labeled. 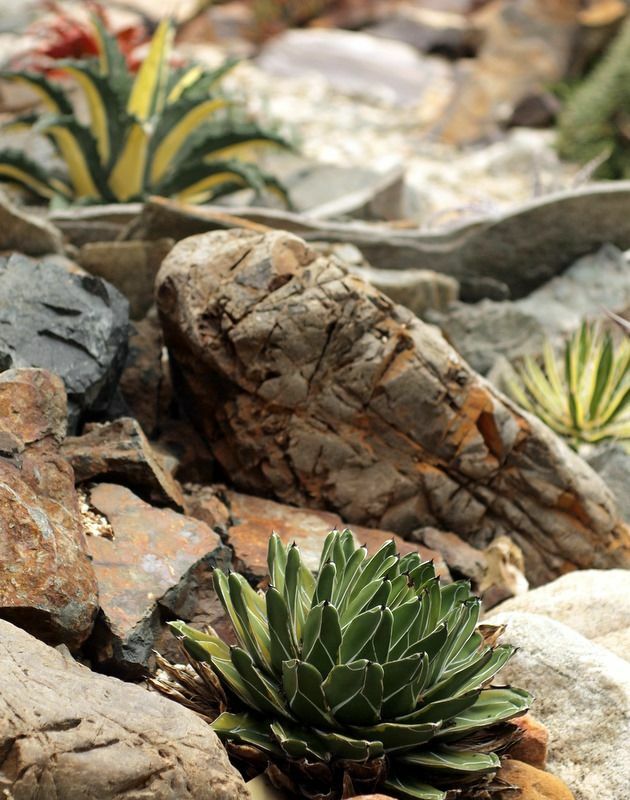 I recognized a lot of familiar agaves, but some of these sweet, choice agaves remained tantalizingly incognito. 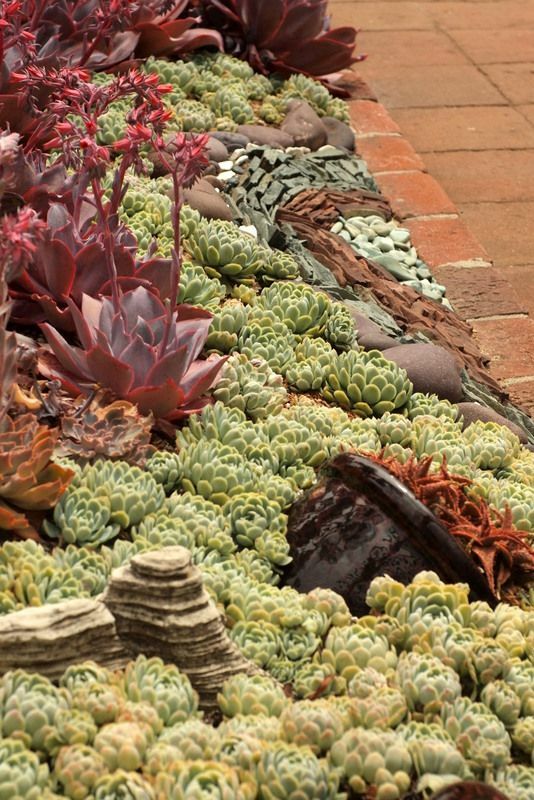 I can imagine how the old, fusty Cactus Garden interrupted and stalled the rhythm of razzle-dazzle built up elsewhere in the gardens, and the new Succulent Garden now successfully carries forward and amplifies this excitement. Once the tone and mood became apparent to me, I was able to fully embrace the little courtyard garden and find it a daring success, full of ideas transferable to our gardens. The plants are flawless and obviously thriving in the new soil conditions. 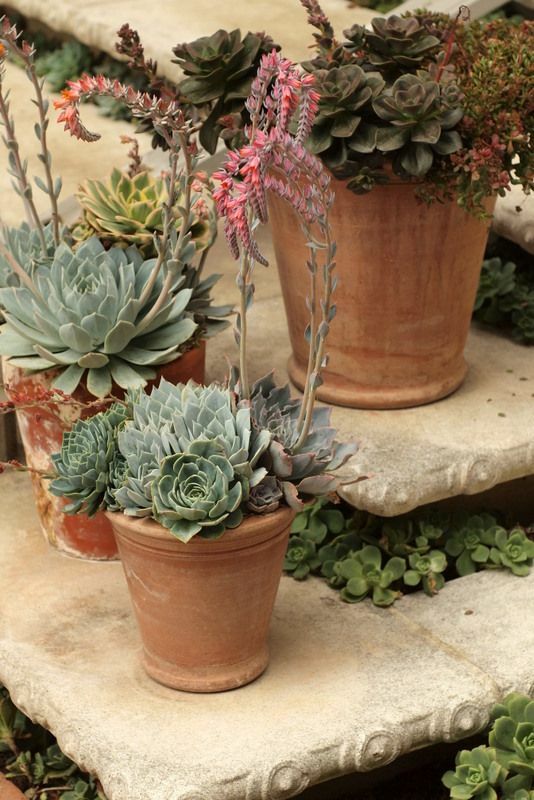 Pacific Horticulture helpfully provides a list of sources for many of the plants used in the Succulent Garden. The photo gallery included at the bottom of the page includes some excellent wide-angle views of the garden. Reprints of the article I’ve quoted extensively from are available. 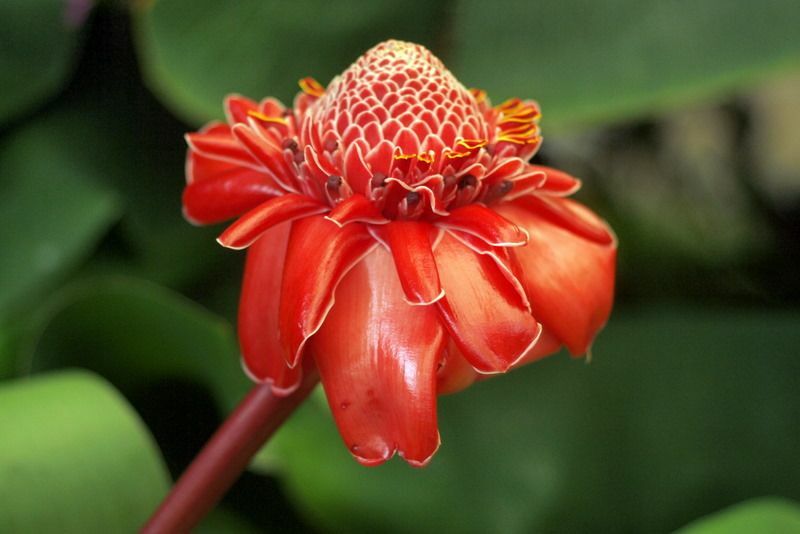 The Sherman Gardens has lathe houses and conservatories packed with exotics like this Torch Ginger in bloom, Nicolaia elatior. An extensive fuchsia and begonia collection. 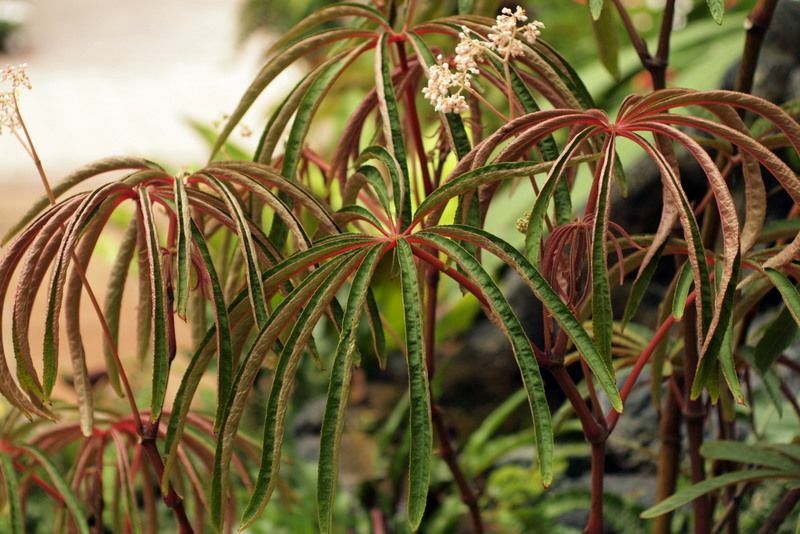 Begonia luxurians. 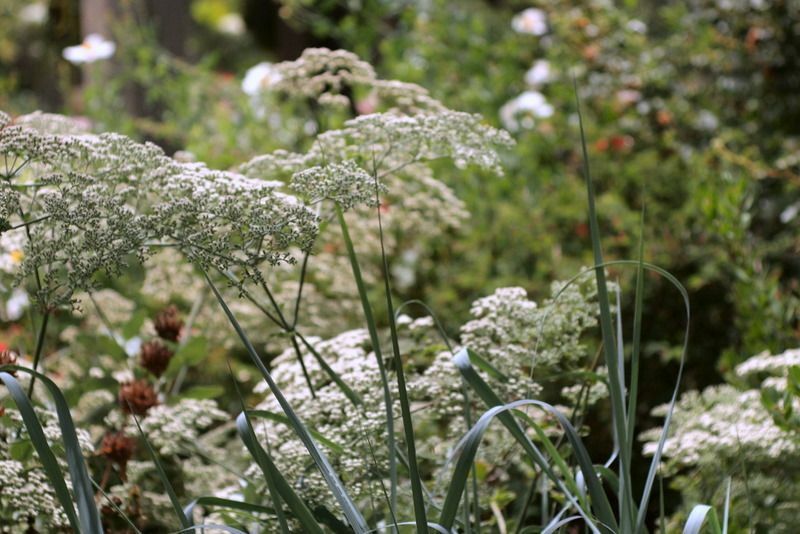 And a small California native section with a huge Eriogonum giganteum, St. Catherine’s Lace, now in jaw-dropping bloom. 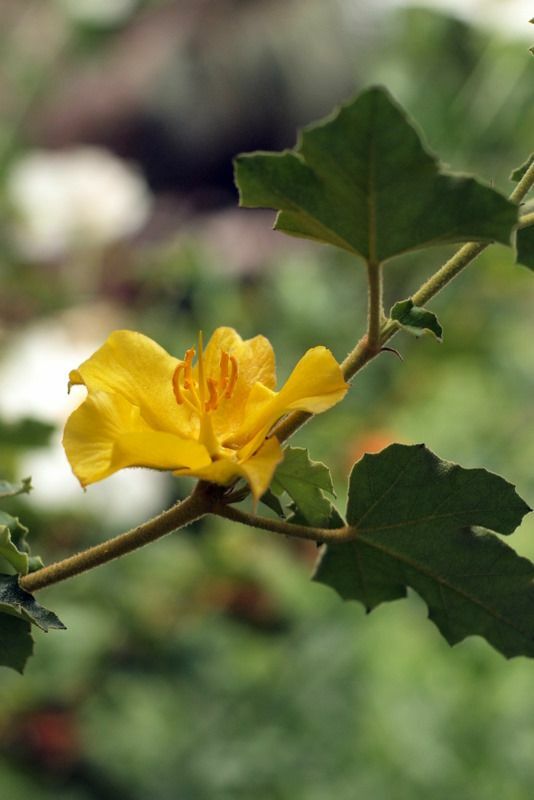 A towering, multi-story flannelbush, the fremontodendron, grown against a wall. 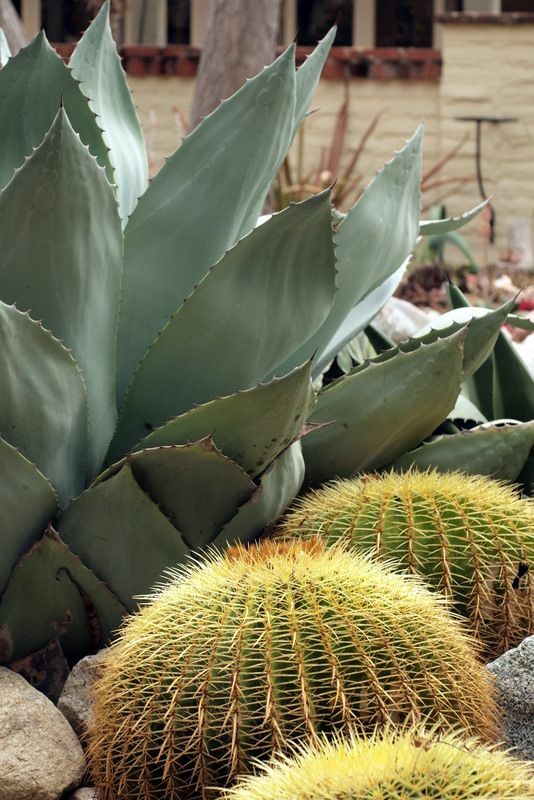 This entry was posted in agaves, woody lilies, design, garden travel, garden visit, Plant Portraits, pots and containers, succulents and tagged Agave 'Royal Spine', Agave ferdinandi-regis, Agave macroacantha 'Blue Ribbon', Agave ovatifolia, Begonia luxurians, Echinocactus grusonii, Eriogonum giganteum, Matthew V. Maggio, Nicolaia elatior, Pacific Horticulture, Sherman Library & Gardens, succulent garden. Bookmark the permalink. Really must see this place next year . I dug out that back issue of PH and read again. Truly living art. He did a fabulous job, and it has evolved beautifully as well. I remember the old version. It looked like it has been planted in the ’50s style wise, though I can’t believe the plants were that old. Kathy, the upkeep and maintenance of this garden is really superb. I’d love to see it again with you. Hoov, I don’t know why it’s taken me so long to get out to this garden, esp. since it’s so close to Roger’s! I can’t believe that is a Begoina! 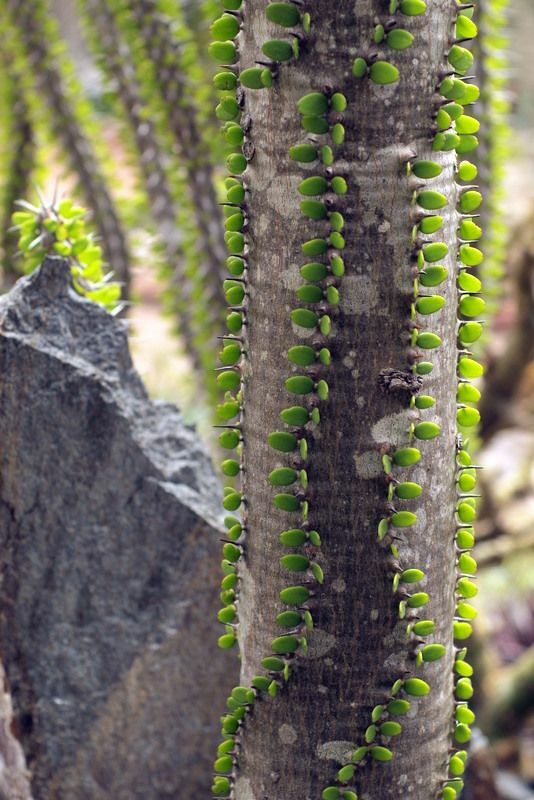 All the other plants are as equally alien, only to be seen in a botanical garden’s hot house. Beautiful images! 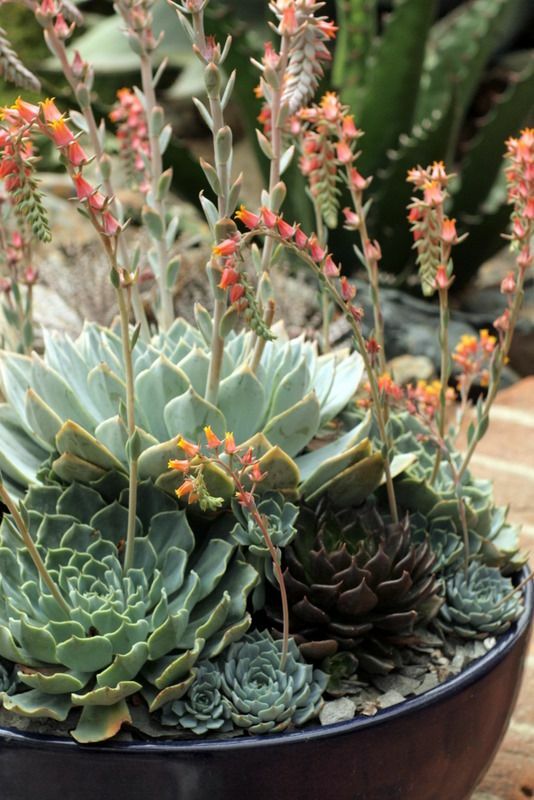 I agree that cactus and succulents have long been given a bad rap being relegated to out of the way places with bleached skulls and broken wagon wheels. 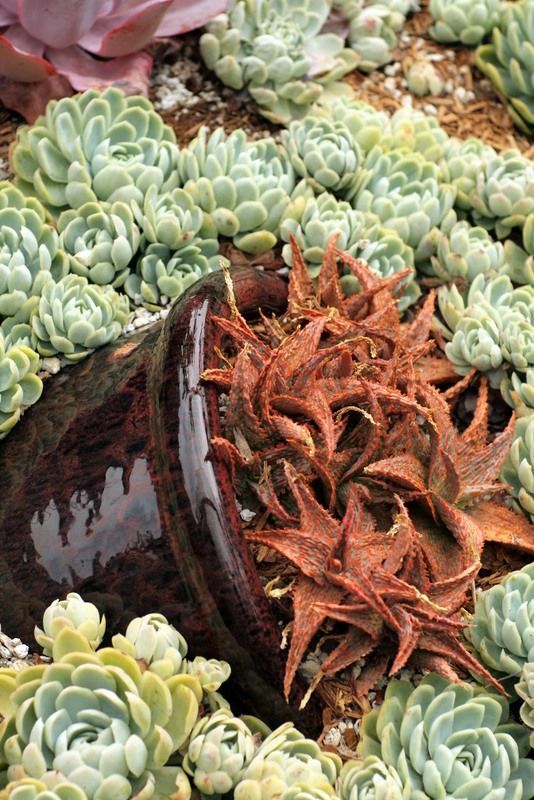 These photos show a very beautiful garden and definitely “shatter conventional views about succulent plants”. Thanks for sharing. Just found you blog and this post. 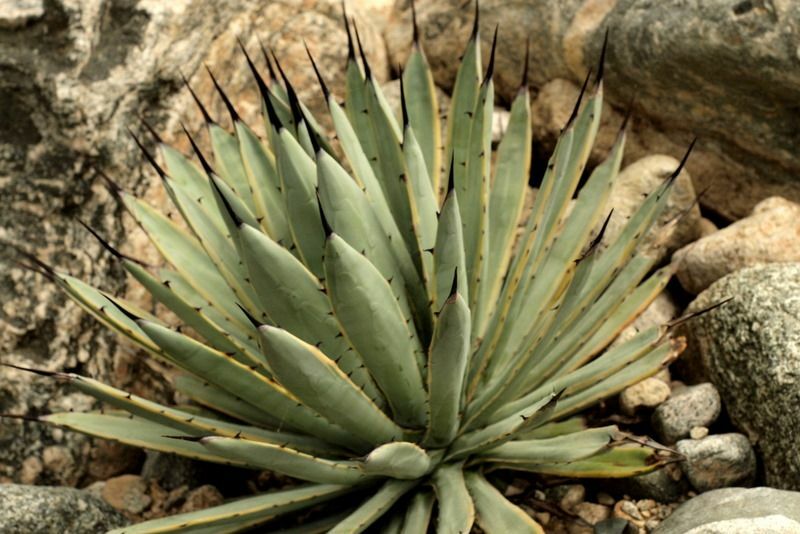 I believe the little unknown agave is a. royal spine. Lovely pictures. Wow, what a unique garden. 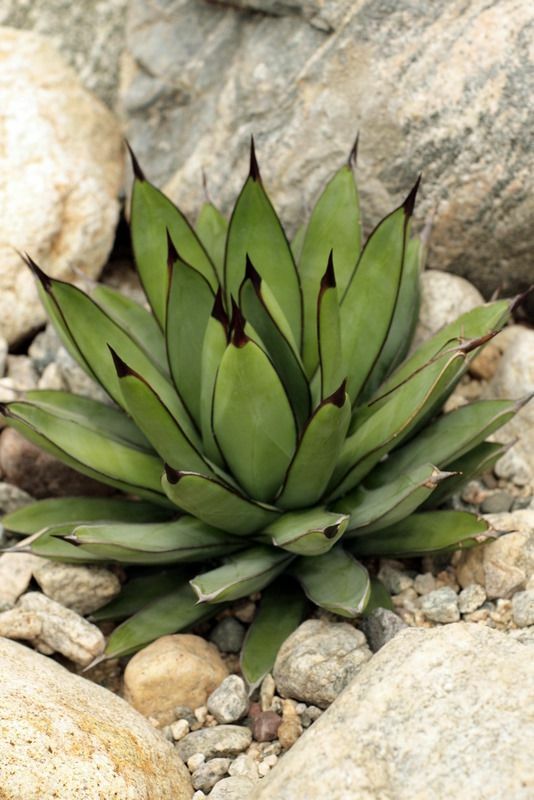 I was looking for photos of Agave macroacantha Blue Ribbons, and I’m so glad I found this post.